CAST BlackTrax is ready to wow the crowd once again during the 2013 Eurovision Song Contest in Malmö, Sweden as one of the show’s Technical Partners. The Eurovision Song Contest (ESC) has been broadcast every year since its inauguration in 1956 and is one of the longest-running television programs in the world. It is also the most-watched non-sporting event in the world, with television and internet viewing audience figures in recent years between 200 million and 600 million internationally. It has launched the careers of artists such as ABBA and Céline Dion, to name a few. Last year the contest was held in Baku, Azerbaijan and the winner (by a landslide) was Loreen from Sweden singing the song “Euphoria”. Sweden has been in preparations since summer 2012 for the upcoming Contest to be held at the new Malmö Arena in southern Sweden. The program, produced by Sveriges Television, aims to sculpt a fully customized creative solution, employing the strategy to deliver optimal impact and to create a memory of a lifetime. The goal for the upcoming Eurovision Song Contest is to take the show to a new level and create a spectacular event full of memorable moments. In order to do that, the production depends on working directly with manufacturers to find the new technologies that will become the standards of tomorrow and to use existing technologies in a new and innovative way, in order to create a palette for the creative team that exceeds the standard norms, and provide the tools needed to reach these goals. ESC technical director Ola Melzig has played a major role in Eurovision since its last appearance in Sweden in 2000. Over the years, he has built a technical model whereby chosen manufacturers, or “Technical Partners”, don’t simply supply equipment – they become involved with technical staff and support of the newest, cutting-edge technologies in the entertainment industry. Melzig pushes the envelope each year by breaking records on number of units used in a show, using products in ways they haven’t been used before, or employing Beta and even Alpha versions of new products. Many products have made their breakthrough performance on the Eurovision Song Contest. It is this powerful collaborative effort that has worked year after year and 2013 promises to be one of the most sensational in history for this hand-selected team of Technical Partners. The 2013 ESC and CAST have agreed that BlackTrax Solution can be used to provide tracking of the talent and props during interval and opening acts. Melzig and lighting designer Fredrik Jönsson were researching new technology during PLASA 2012 and saw the potential for BlackTrax to automate the production with realtime tracking. 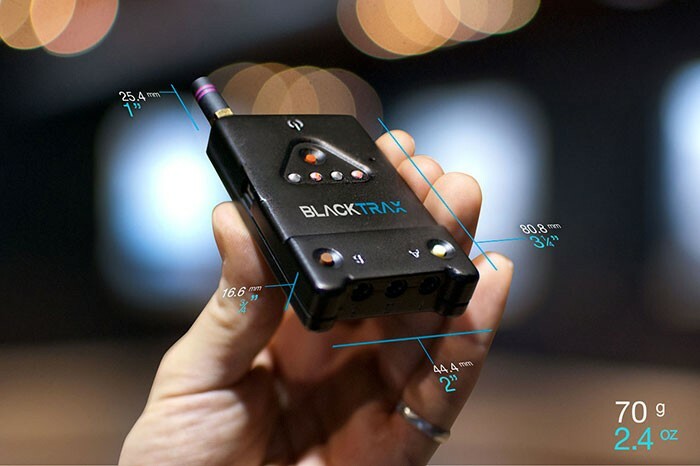 BlackTrax allows spontaneous, seamless tracking of performers and props and CAST saw the enormous potential to demonstrate and promote the powerful combination of creativity + artistry + technology – the next revolution in entertainment production. It was during PLASA that BlackTrax nabbed the only Gold Innovation Award. 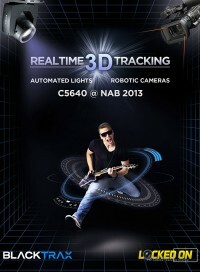 The technology had also won a prestigious “Game Changer” Award at NAB earlier that year. The creative team behind Eurovision knew that BlackTrax was one of those special technologies to come along that would take the production to the next level. 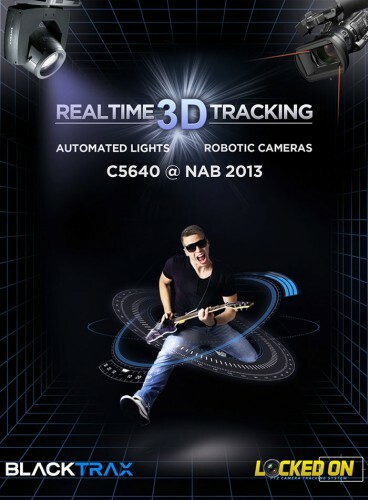 BlackTrax is a powerful, accurate and cost-effective tracking technology solution that delivers precise 3D & 6D positioning to controllers for interfacing automated and robotic technologies used extensively in event production. Using proprietary IR and RF, it delivers dynamic streaming positional data with six degrees of freedom (x, y, z, plus roll, pitch & yaw) to 3D and spatial audio, automated lighting, multi-media servers and robotic cameras – all at the same time, in realtime. One or more people wear a BTBeacon, which is tracked in the defined Space by BlackTrax. Anything tagged with a flip phone sized battery-powered BTBeacon, which carries an IR LED, gyroscope, accelerometer, and tiny wireless radio, is tracked inside the Space of up to 160 feet (49 metres) in diameter at over 100 frames per second by the overhead BTSensors. In parallel, the Trackable’s orientation – roll, pitch and yaw – is communicated by RF directly to the BTServer. Should the IR line-of-sight become momentarily obstructed, the BTBeacon’s onboard Inertia Measurement Unit provides double-redundant 3D positioning via its tiny radio transmitter. Being seen by millions during the live broadcast is only one of the ways in which BlackTrax will be showcased during Eurovision. Fans of the show can learn the intimate details of the daily setup for the show via the wildly successful Eurovision Diary (www.m-m-pr.com/index.php/esc-diary-2013), and for the first time, the 2013 ESC will host PLASA Focus Backstage Malmö, specifically created for this project at which only Official Technical Partners will present in a hall inside Malmö Arena. This special trade fair is open to invited guests, VIPs and the general public, all of whom will also get a special backstage tour. During PLASA Focus and the tours, visitors can see BlackTrax in action and speak with CAST BlackTrax experts. It provides an exceptional opportunity for those looking for a unique tracking solution for their upcoming projects to see the technology at work on a grand scale. More information and show passes can be found at www.plasafocus.com/backstagemalmo/.